PICT Wooden Spoon 2013 Winners Jennifer Deacon & Amy Adams. Runners UP Johnston Cup 2013 Claire Victoros & Ray Williams. Runners Up Penman Trophy 2012 Barrie Farnsworth & Graham Hall. Usual concerns as this year's event approached, will the weather continue to be kind to us, are there any last minute injuries and how are we going to get more ladies to take part in this annual event. The one thing I did not anticipate was the arrogance of the Penman Trophy winners to not bring the trophy as last year's holders to present to this year's winners on the basis that they assumed it would save them carrying it around all day! I'm not going to mention any names as this year it was only one of the pair, but in previous years the other of the pair admitted to doing the same. As Brexit approaches the previous year's foreign influx are conspicuous by their absence this year. Once Mother Theresa May has sorted, it hopefully normal service will be resumed next year....yeh right. Very welcome Newbies this year included Mike Dobson & Eric Keane along with some past players that paired up together in Phil Trudgeon & Paul Williams. I was almost about to relinquish my partner as I feared Mr Trudgeon had mixed his day up but local traffic released him and the day was under way. May I at this point say a thank you to Paul Johnston-Knight this year's President for not only attending the majority of the day but also for kindly presenting the trophies. An amusing aside was that Martin Dibsdale who this year retires from the industry from Premier Paper thought that it was his last appearance and that he was quite sad and assumed once retired would not be allowed to frequent the PICT Tennis. Martin, have you not seen the fossils you are surrounded by on the courts! Bless him, he was so pleased and we look forward to you and Martin Lloyd Hagger playing for many years to come. A major thank you to Fedrigoni UK who once again sponsored the gorgeous lunch. An equally grateful sponsoring of balls, courts, trophies and bar person (me) from a combination of, The Navigator Company, Mitsubishi HiTec Paper UK means that we are able to donate the sum of £300 to the P.I.C.T. We had 9 pairs this year, well that's not entirely true as we allowed a trio to enter in the shape of Ace Bothwick, Brian Garson and David Kentish who were allowed to field any 2 of the 3 squad based on fitness checks before each round. The hidden agenda here was that they had their eyes on the coveted wooden spoon all along as they amassed 2 points in the round robin section. Not sure who got the 2 wooden spoon trophies to keep. The Johnson Cup final we had Mike Dobson & Eric Keane facing the holders Martin Dibsdale & John Lloyd Hagger in the final. Amazed after a day's tennis that they opted to play a best of 3 sets final, the experienced holders were too wily for the newcomers who I hope return to try and reverse the result next year. 6-3 6-3. And to the Penman Trophy, which was to be contested by the 3rd year in a row by the holders against yours truly and my partner Matt Kidd in an attempt to grapple the Trophy from their clutches. It was Matt Kidd's and my turn in the semi-final to knock out Tony Wood & Steve Maher 6-4, whilst the other semi final was won by Andrew Dunning & Jonathan Clay again 6-4 against Paul Williams & Phil Trudgeon. Seeing as Andrew Dunning left his trophy at home Matt & I thought we would not complicate things by beating them this year. Jonathan & Andrew ran out worthy winners 6-2, 6-2, well done, but we will be back! Once again thank you to all the players, sponsors and Northampton Lawn Tennis Club. We were blessed by the weather gods this year! As the week approached we had rain Monday, rain Tuesday, rain Wednesday, it stopped on Thursday for the duration of the 2017 PICT Tennis day – we even had some beautiful sunshine for a large part of it, and then on Friday it continued to rain. This year's tennis virgins included seven of the 20 players, with a delegation that included a tennis coach from Germany and a self-adhesive vinyl expert from Switzerland. We had representation from all parts of the industry: manufacturing; merchanting; agencies; OEM manufacturers; and printers. A very big thank you also to this year’s official photographer Brian Garson, who was far too nervous about his daughter's forthcoming wedding and was considering his recovery period from a full day's tennis, he'll be back hopefully next year for his Wooden Spoon presentation. With an even bigger thank you to Fedrigoni UK, which once again sponsored the gorgeous lunch. An equally grateful sponsoring of balls, courts, trophies and bar lady from a combination of ATP, The Navigator Company, Mitsubishi HiTec Paper UK and Denmaur Paper, means that we are able to donate the sum of £350 to PICT. With 10 pairs it made the format fairly straightforward. The Round Robin top four went into a semi-final for the Penman Trophy, the next four for the Johnstone Cup, with the bottom two fighting it out for the coveted Wooden Spoons. And so in reverse order, we have two of the many newcomers below with the sought after Wooden Spoons for 2017. Sam Ayling from Ricoh UK and David Kentish from Mitsubishi UK who were up against Gary Kelly and Richard Simpson two more of the newcomers. Gary Kelly and Richard Simpson won the set 6 - 2 and so below we have our Wooden Spoonists. In the Johnson Cup final we had Graham Hall with new partner Pete Stevens from Fedrigoni UK (who beat Andrew Veasey and Simon Bishop 7 - 5 in the semi) up against Doug Hacking and Steve Plaistowe (who beat Daniel and Axel 6 - 3 in the semi), how Daniel was still playing this late in the day was astounding considering he badly twisted an ankle in the second Round Robin match in the morning. 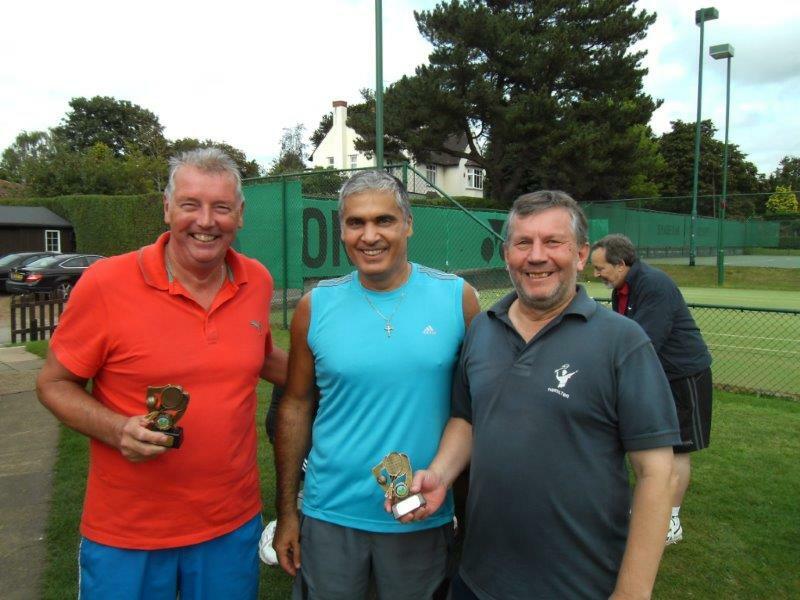 Doug and Steve triumphed 6 - 3 as we can tell from their larger trophies compared to the runners-up!) They sensibly decided to play a one set final! And to the biggie, the Penman Trophy. This was to be contested by the two year in a row holders against yours truly and my new partner Matt Kidd, in an attempt to grapple the Trophy from their clutches. Jonathan and Andrew beat Steve Maher and Tony Wood 6 - 4 in a very closely contested semi final. Whilst Matt and I despatched last year's Johnston Cup holders Martin Dibsdale and John Lloyd Hagger 6 - 2 in the other, to set up the final. A three setter was agreed, mistake number one! We took a thrilling first set and also led comfortably in the second, but the tide turned and experience and consistency shined through and the holders have done the hat trick. Well done to Andrew Dunning and Jonathan Clay with a valiant attempt from Matt Kidd and myself. I will try and get a date in September next year when I know they cannot make it, only joking. Hopefully, we'll all be back and many more attend in 2018. My only silver lining was the shot of the match - a behind the back down the line winner during a rally in the second set. I can confirm the date for 2018 is Thursday 13th September 2018. Save the date! Also the 2018 PICT Tennis Tournament will be a very large anniversary of the Penman Trophy and we will try and mark it with, if numbers and support allows, an evening presentation to commemorate it! Well it was going to be on the 17th this year but clashes with the Ashes, the Rugby World Cup etc etc meant we pushed this years Tennis to September 24th which meant toying with the weather forecast and unfortunately people that could only make the original date missing this year’s annual event. On the plus side it enabled a few more new faces that could not make the previous week. The Clothes Show at the NEC sports section appears at Northampton Lawn Tennis Club, methinks not! We have a luminous orange pair, a bearded man in pink, many Men In Black, hoping it makes them look slimmer, a few that look the part and a smattering of Men in Moobs…that included me. Newbies this year included Derek Boyle who flew in from Scotland just for the day, Paul Williams from Morgana, and Martin Dibsdale pairing up with John Lloyd Hagger. We also had a very welcome return of the sprightly Peter “Ace” Bothwick, hip hip hooray! A very quick thank you also to this years’ official photographer and guest Barry Gregory who also sponsored the balls, quality piccies. Also a big thank you to this years’ kind sponsors: Fedrigoni UK Ltd for lunch, Stora Enso for the Courts, and Warings Ltd for the flowers. Once again this has enabled the sum of £280 to be sent to the P.I.C.T. to use towards all their worthy causes. The Round Robin pre and post lunch were as ever a sounding out for those that vied for the Penman Trophy and those that calculated to ensure that they should aim for the Johnston Cup. Having looked at the pairings we had what was for a bookie a forecastable outcome and the outcome which was merited all round was to be new names appearing on both trophies. The pairings allowed for a little fun towards the end of the round robin as one of the pairs was this year allowed to be a “perm 2 from any 3” in the team that was made up from the squad of “Ace” Bothwick, Brian Garson and Kenneth Jones. In the last couple of round robin games they were allowed on court as a trio, to no avail as they successfully achieved the “Wooden Spoon 2015” Winners. Here they are against Jonathan Clay & Andrew Dunning looking like a team possessed and ready for nothing. The Johnston Cup went to a straight one set final between newcomers Martin Dibsdale & John Lloyd Hagger against one of last years holders Andrew Veasey & new partner Tim Bowler. I gave it away earlier with new names on the trophy, with a 6 – 1 win the new holders of the Johnston Cup are Martin Dibsdale & John Lloyd Hagger. The Penman Trophy did have a one set semi final to take place between Round Robin 1st place Jonathan Clay & Andrew Dunning back together versus 3rd in Round Robin Lee Smith & Derek Boyle. The other semi was 2nd in Round Robin Paul Williams & me against 4th in Round Robin Graham Hall & Barrie Farnsworth, the luminous pair. Two very close sets saw Paul & myself sneak through to the final 6 – 4 and Lee & Derek 7 – 5. The final which was best of 3 sets whilst the crowd were partaking of cakes, cheese and biscuits and drinks from the bar did not look like it would take long. If it was a boxing match the ref would have stopped it. The 1st set was 6 – 0 to Lee & Derek and Paul & I did not know what to do to try and at least make a game of it. However the 2nd set became a tight and more even affair but the end result was 7 – 5 to Lee & Derek who paced themselves in the Round Robin and were consistent in the latter stages so the new names on the Penman Trophy 2015 are Lee Smith & Derek Boyle. Hopefully both set of winners will be back to defend their titles and we get the missing pairs, due to the date change, back to get record numbers for the 2016 P.I.C.T. Tennis day. I can confirm the date for 2016 is Thursday 15th September 2016. Save the date! On Thursday 11th September 2014, for the first time since Jack Perry handed the baton over for the PICT Tennis Tournament, the one thing I always fret about, the weather, was for once almost a guarantee. I still, however, worry about the numbers year on year, especially when I hear about clashes with cricket and past presidents’ lunches possibly leading to double booking or having to choose one or t’other. Talking of presidents, many thanks to Alan Badcock who spent a large part of the day with us and kindly said a few words. Well, the day itself graced us with 18 players, 9 pairs and amongst them as you see below 4 ladies who look as fresh and lovely as the flowers they hold! The “before” photo below shows many of our regulars but also some very welcome “newbies” whom I hoped enjoyed the day enough to become regulars in years to come. Ace Bothwick once again was the official David Bailey for the day whose presence as a player once again will hopefully be soon, but he’ll still be official photographer also! Dodgy picture of the day goes to: “holiday legs” vs. “no holiday legs”. Guess who they belong to, answer at the end. Virgin PICT tennis players this year included: Sara Gladstone, Dan Barrett and Sam Thomsett who travelled at least 22 yards to join us with hubby Mike. Returners from years gone by included Ken Jones and Lee Smith whose company also made a separate donation to the charity. The Round Robin with 9 pairs played beautifully into the system. Top 4 fight it out in semi-final of the Penman Trophy, with next 4 fighting it out for the Johnston Cup, with 9th place an outright winner of the Wooden Spoon 2014. I was fortunate enough to recreate the pairing that lost in the final of the Penman Trophy a few years back, as Jonathan Clay’s regular partner Andrew Dunning was double booked for the day, and as Andrew Veasey hooked up pith my wife’s partner from last year, Claire was paired with the returning Lee Smith which ended up a very formidable team! Meanwhile Tony Wood & Tim Bowler returned to defend the Johnston Cup whilst Ken & Sam Thomsett allegedly were to fight for the right to Spoon with Brian Garson & Mike Thomsett; little did they know how it would finish. Sadly Paul Le Serve was diverted to an impromptu Head Office meeting so we adapted the Round Robin to an invitation cameo appearance each round from the pair that sat out to play each round with Karen. We hope to see the return of the aptly named Mr Le Serve in 2015. In reverse order then, congratulations to Ken Jones & Sam Thomsett on certainly Ken’s sole intention to win the 2014 Wooden Spoon to add to previous conquests that adorn his works trophy shelf. The semi final of the Johnston Cup saw a very pleased Brian & Mike await the out come of Andrew & Ray versus Sara & Dan. This was because Karen had disqualified herself due to no more cameo partners, besides she’d seen the cakes set aside for afternoon tea! Ray & Andrew quickly saw off Sara & Dan and in the final swept aside an elated Brian & Mike who were very chuffed to get the runners up mantle in the Johnston Cup. Very well done to Andrew Veasey & Ray Williams a new pairing on the Johnston Cup but not new names to it. Now for the Penman Trophy. 1st semi final saw ‘er indoors with new tennis partner Lee Smith up against Barrie Farnsworth & Graham Hall, last years losing finalists! Well, boy did they not want to have that losing feeling again. A close fought battle went in favour of Barrie & Graham 6 – 4. I can admit now that the psychology of possibly meeting my good lady in the final was occupying my mind a little in the semi-final, not sure why cos we had to get past Tony Wood & Tim Bowler first. But we did get there although the score flattered us a little after a tentative start 6 – 1. Well here were Jonathan & I again, once upon a time losing Penman finalists against last years losers. As the 1st set unfolded my thought process as organizer and playing a final against a pairing that are also customers, was to say you’ve got to let the customers win, haven’t you? The thought was far from my mind, but in a 3 set final the first set was over before I could even have such a thought 1 – 6! Barrie & Graham were high fiving and full of confidence, whilst Jonathan and I discussed what went wrong. I must admit I was a little worried about the time and my co organizers, Ace & Claire, began the presentations whilst Jonathan & I needed to focus on the task in hand. Well, set 2 saw us dig in and turn it around6 – 2 and momentum continued with the same score in the final and deciding set. Thank you to the opposition for a knackering but enjoyable final and hope to se you try for 3rd time lucky in 2015. Congratulations to Jonathan Clay and yours truly Winners of the Penman Trophy 2014. Most importantly I would like to thank all the sponsors for the day: Lunch, Courts, Trophies, Flowers, Balls, Bar Staff etc do not come free. Thanks to Fedrigoni UK, Mondi UK, International Paper, Sappi UK, Premier Paper & Warings most of the subs for the day are donated to the P.I.C.T for all the good work they support. The total on its way to Anne James is £340.00 + £100.00 raised from our F.A.Cup Final Wembley onesie Day from Barry Gregory + £100.00 donation from Lee Smith’s company Webmart Ltd taking the grand total up to an impressive £540.00. At the end of the day it looked like we need a combination of Voltarol & Ibuprofen as sponsors with support from St John’s Ambulance. I do hope all enjoyed the day enough to save the date for next year which I can announce will be Thursday, 17th September 2015 . On Thursday 12th September 2013, we saw the return of a couple of names from the past whilst at the same time welcoming some high profile names in the industry, one of whom ended up with his name on one of the 2 trophies up for grabs. As you can see from the “before” photo we have a reappearance of Ray Williams, who due to the last minute non appearance of Hamza Khan from Premier Paper’s credit control department, ended up with the pleasure of playing with my beautiful wife, leaving me in a proper co-ordinator’s role. Very frustrating but I got lots of phone calls made and realised I should have brought my lap-top. We were also in the presence of Tim Bowler who I believe is officially a PICT virgin. At the same time we were also graced by three ladies, two of which paired up and looked resplendent in their matching white tops and black trim, the other my better half. This year also saw a pair of printers teaming up against their paper suppliers and manufacturers. A big thank you as always to all the sponsors who helped cover the costs involved in the day: Fedrigoni UK for the gorgeous lunch, Mondi for the courts, Papico for the balls, Burgo UK for the trophies and Warings Printers for the flowers. This kindness enables the monies left over and subs for the day to go towards P.I.C.T. charity funding, so a cheque for £300.00 is on its way to Anne James. Sadly the weather leading to the day prevented us from grass court play this year but on the day ended up being very kind to us all. So with 6 pairs we had a round robin before and after lunch which would culminate in a straightforward top 2 fighting it out for the Penman Trophy, 3rd & 4th fighting it out for the Johnston Cup and 5th & 6th position for the cherished wooden spoon. As the round robin unfolded it was obvious there was 4 pairs that would all be fighting for the Penman Trophy top 2 places and that 2 of them would have to fight it out for the Johnston Cup, with the new to tennis all lady pairing fighting it out with Brian Garson and the man with the tennis club that is just an extension of his garden Michael Thomsett for the coveted Wooden Spoon. A very pleasant lunch was served so much so that everyone tucked in and I forgot to take a piccie! The final standings saw only 4 game points separating the top 3 pairs, with favourites Jonathan Clay & Andrew Dunning scheduled to meet the new printer pair of Graham Hall & Barrie Farnsworth in the Penman Trophy Final. Only 2 more game points behind which may have been a game plan for Tony Wood & Tim Bowler saw them 3rd with ‘er indoors and Ray Williams a comfortable 4th to battle for the Johnson Cup away from the “Spoonies” Brian & Michael who would meet with Jen & Amy. Winners Johnston Cup 2013 Tony Wood & Tim Bowler. So to the Johnston Cup Final which saw Tony Wood pairing up with a 3rd different partner in as many years. Does he wear them out or scare them off, nobody knows. In the best of 3 sets it turned out that Mr Bowler has obviously played the game before and may be the first partner to Mr Wood that comes back and defends a trophy! Ray Williams who has previously paired up with a Vic but not Mrs Vic put up a brave fight but were seen off in two sets 6 – 3, 6 – 2. The Penman Trophy began on Centre Court in front of the Official photographer Ace Bothwick and a crowd which included Fred Haines and Jeremy Martin, Karen Scurfield along with many onlookers beginning to arrive at the tennis club. Winners Penman Trophy 2013 Jonathan Clay & Andrew Dunning. The opening round robin match was between these 2 pairs on the same court and it made for a very close encounter which saw the printer pairing of Barrie & Graham beat the favourites in my book prior to a ball being hit Andrew & Jonathan 5 games to 4 in the best of 9 games. However the final was to prove the opposite as the favourites took the Penman Trophy 6 – 1, 6 – 2. The experienced pairing of Brian Garson & Michael Thomsett proved far too strong for the brand new lady pairing of Jennifer Deacon & Amy Adams who promised to come back stronger in 2014. Brian Garson was snapped posing with one of the main trophies but as we all know if this is to become a reality reincarnation has to be the order of the day whether as a tennis fan or a Spurs fan! Once again, thank you to all that participated and facilitated. I hope a great day was had by all. I look forward to welcoming back pairs that could not make play this year due to late holidays, wedding plans, house moves and injury, they know who they are, and get the numbers up for 2014 so please keep spreading the word.